After watching the last episode, I'm a little disappointed and back with an updated review. I'm have watched the entire series including both Season 1 and 2. So I'm under that assumption you watched Season 1. In the second season, the series focus a little more on the plot and detail and brings the characters together Shino met from Season 1. They do still have to go to another town or village but it was a little more in depth. One thing that appeals a little more in Season 2 is a little more focus on the characters. They spent two episodes each for Daikaku and Yana and surprisingly two and a half to three episodes focused on Shinobu. But after that, they rushed the ending in two episodes. There was so much information and stuff thrown at you that it's hard to swallow it all in one gulp. However, the overall concept of the story is unique with the Eight Dogs of the East and the different gems/beads. The art is absolutely amazing. The depth and detail on each character is quite unique. A lot of time was spent on the characters with each character being different even including the characters that only show up once or twice. The landscape and environment is always breathtaking. Even the small house of Daikaku out in the mountain was pretty well done. The Imperial Capital in which the series likes to focus around is always elegant. The detail putted into the city was quite superb. I could babble on and on about it but you won't see how beautiful it is until you watch and pay attention to it. Like I said about the story, there was a much better improvement on the characters themselves from Season 1. They bring all the previous characters together at the Capital which was interesting. The characters also show a bit of emotion towards one another and at times it can be amusing and funny when they meet each other at the Imperial Capital. One thing I liked is that they spent three episodes on Shinobu. It allowed us to understand Shinobu's past and how he feels. I wish they did that with the other characters such as Dousetsu for example. They only introduced him in one episode in Season 1 and brought him back by bringing him to the capital in another episode. Hamaji didn't make much of a debut and there wasn't a lot of development even though she was essential to Sosuke and Shino. I wished they did more cameo on her. Overall, I would give it a high 7 or low 8. But since I can't do that, I gave it an 8 because there was a lot of potential in the series. I just wished it wasn't very rushed since the anime is based off the manga. I really wished they would focus a little more on the characters that didn't get the spotlight. If you read the manga, the anime does leave quite a bit of detail and hints that I find significant. So I recommend reading the manga if you can. And for the last episode. I'm really upset at the rushed ending. I normally have these 'feels' at the end of most anime but this one, it wasn't as impact-fully because it was rushed so much. You kind of expect for a rushed series especially after watching Episode 4 from Season 1. The ending was kind of predictable to in my eyes. However, there was a lot of cliffhangers and mysterious questions that allows Hakkenden: Touhou Hakken Ibun to go for a third season. Despite a 'The End' in Episode 13, the ending they left allows a possibility for a third season if they desire. I don't think the manga has actually 'ended' thus another positive side for those who want a Season 3. Other than the rushed ending, it was still a comforting and warmth ending. Everyone seems very happy and I loved that they did scenes of each character. Even the characters that only made a small debut made a cameo. In the end, it was a nice series with a unique turn on supernatural like genre. I loved the protagonist Shino as he is a very cute boy. It was an enjoyable series and I would recommend it but it wasn't the best anime. This review will contain spoilers for the first season only, it is strongly advised to watch the first season before viewing the second season. Hakkenden season 2 continues right where season 1 left off. In this season Shino and his group continue to search for all eight of the marbles. The new character Ao becomes slightly more present in the second season, but not as much as I would have liked him to. Although I did enjoy this season, I found the second season to not be as "good" as the first season in terms of episode quality consistency. I expected the plot to be more in depth, but it felt extremely rushed. A lot of the episode were wasted on side-plots that did not relate to the original main plot. If this were a longer anime it'd be more understandable, but with only 13 episodes left the plot should have been more focused. Some episodes were simply awesome, while others were dull. What I did like though, was how well the tone switched so subtly, whether is was from happy to sad, or sad to funny. All the tones were well done, sad moments were truly meaningful, and the funny moments were actually funny. The anime did pick up in progression towards the end pleasantly. There is not as much character development as I hoped to be, and there seems to be a lack of consistency in episode quality. Some episodes are very interesting, while others are irrelevant to the plot, or simply just dull and not entertaining. Coincidence is a key word, the characters with marbles seem to randomly gather together. The story even mocks itself by mentioning how coincidental all of these events are. What the story does do though is, create a strong "family" bond between all the characters that come into the story. Each character is given a back story and a defined personality. The art is exemplary, it's evident that a lot of time and focus was spent on the colors and details. This anime would not be worth watching if it were not for the simple eye candy of how pretty everything is. The colors are soothing to look at and the characters are well drawn. The OP is okay, the ED is better than the OP and provides a great end to each episode. I'd still definitely recommend watching the second season if you enjoyed the first season. I wouldn't have too high expectations, but nevertheless, I still enjoyed watching this season. Towards the end the anime started to catch back on track and really become interesting. Well once again I'm here only seconds after finishing this season. As always, I spot the anime and it takes me a long time just to start up on it, in this case, I had already watched the first episode of the first season in dubbed. That wasn't impressive enough for me. After a couple of years, I came back and watched the series in their native language. 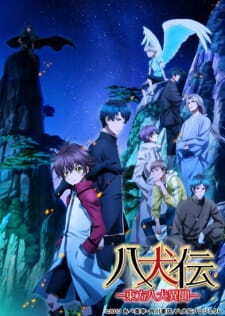 This season of Hakkenden took me on another emotional ride. To start off with, I love how Shino and Sousuke's trust in each other were put to the test and the result did not fail to surprise me. We followed the main characters around several places in the world they live in, and they helped out many people they met on their path. I must say that some of the people they encounter had a fate that I didn't expect to see. Another emotional point, unlike the first season, this one had episodes that ended in unexpected and sad ways, tragic, nonetheless. It felt though as if the last episode got a bit hasty, finishing the story and all and I would've liked to see a longer fight and a more dramatic ending perhaps. I love every single bit about the art, so beautiful. There were so many details in everything, and more specific, the hair and eyes of each character. Very detailed and they were all unique. The landscape was just as beautiful and overall, this art style will always remain as one of my favourites. Nice sound and the voice actors did one amazing job. The ending song though, I could cry over and over because of how emotional it is. All of the scenes there were shown in it, worked well with the song. All of the main characters are unique and has their own stories to tell. Once again, Shino and Sousuke are the ones I wanted to know more about. Over time, more things were revealed about each character. I enjoy reading into stuff and pointing out details although there wasn't much to point out here. They all have unique powers and prove to be strong, some individually strong, and other characters, not so much. It took me two days to watch the season from start to finish while trying to save episodes so that they may last longer but that simply did not work. That's how attached I got to it, unlike the first season that took me a week to finish because it was easy to save the episodes a bit. This season was the one that hit me the hardest in the feels and the entertainment overall. Some episode endings did leave me a bit in the dark but it wasn't 'impossible' to figure out what the story we were left with was. Of course, this anime surprised me like most of the anime I've written a review for has. I took a strong liking to Shino, Sousuke and Ao and they'll always be my favorite characters of this anime. The anime ended without many questions left to ask so that's good. I wouldn't mind a new season of Hakkenden but it probably won't be happening anytime soon since the release of this season was a pretty long time ago. If you liked the first season, then you will like this season twice as much. While the first season introduced the main cast, this season expands on their stories and answers some of the unanswered questions posed initially. So far we haven't found all of the 8 holders of the jewels but are getting pretty damm close. It's kinda weird that looking for them is kinda like a side-thing but this doesn't hurt the story at all. I am very happy that we get to find out more about the characters' past. It makes the story seem more complex, like the characters are all linked to something bigger. They have also introduced some very nice side stories that featured minor characters, some recurring, some not. I am very happy to say that there has not been a single dull episode so far. The story is a little hard to predict but it's very engaging and makes you wish you had more. Overall I'm very existed to see how this anime progresses.